P. Diddy, Puff Daddy, what the f**k ever, as Miles Davis? I don't care what he calls himself, I just call him Ballsy! This is outrages!!! Diddy isn't convincing to me as an actor...not in the least. I still 'see'/'hear' Diddy when he's onscreen. SMH. There are better actors who could portray the legendary Miles. Why does this fool think that he can act? Why does anyone else? As Miles Davis HELL NAW!!! 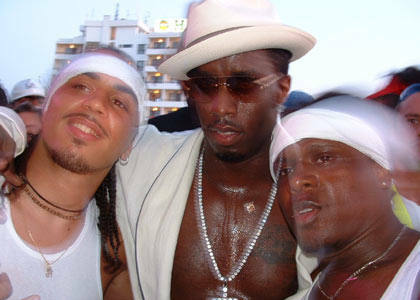 Diddy can't act or rap, I dont hate on his business skills but as Miles Hell No!! Him playing Miles is like Woody Allen playing Duke Ellington ! News flash to the casting department PUFFY CAN'T ACT! He might not be Master P bad...but he's at least Ice T bad. And why are those 3 brothers all sweaty and standing that close.....never mind. Yeah that would be a bad move, i vote for Don Cheade. Absolutely no frickin' comment! Anyway, I've seen some dumb s**t in my day, but this takes the cake. @madame z: I agree that when Diddy plays a part, all you see is his image. Thumbs waaay down on this one. @sdg1844 and ms. m: okay?! I knew Ms. M would give this her infamous "REJECT" stamp! @darkside: lmao! not Woody Allen! @db: I would say closer to P than to T, honestly (hey that rhymed). I thought the same thing aout that picture---that sh*t looks zesty as hayell! @clnmike: Cheadle is perfect for Miles. He can get a straight attitude real quick, just like Davis. @shelia: this was truly deserving of a WTF volume, for real. I'm speechless. There's no way in the WORLD i could possibly see it. @jon: I would see it---it has to be seen to be believed!